Harper and Brother's Author's National Edition, released in late 1909 was the lowest priced uniform edition of Mark Twain's works issued. 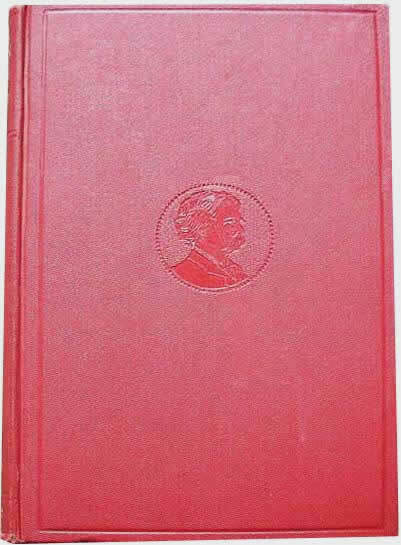 The Author's National Edition bound in red cloth was released in 1909 and sold for $25, half the price of the lowest priced set of the Hillcrest Edition. The Author's National Edition could be purchased on the installment plan and was widely advertised in newspapers and magazines. Ads featured coupons that could be clipped and sent back to Harper and Brothers requesting sets on approval. Clemens received a royalty of $1.50 per set sold. According to the business ledgers of Harper and Brothers, at the end of 1909, Clemens received $558 on 372 sets sold in the first few months the set was available. The first sets advertised were for dark red cloth binding. One set features a spine with a printed dark blue section with gold lettering for the title, printed to resemble a leather label. A second type of binding features red cloth stamped to resemble a 3/4 leather binding. The original sets were shipped with brown paper dust jackets, although few samples of the jackets have survived. 1909 Author's National Edition featuring red cloth binding stamped to resemble leather along with gilt lettering. 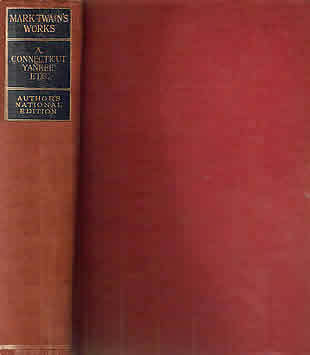 The Author's National Edition flyleaf appears in all volumes of the edition. This statement appears on the back of the flyleaf in all volumes of the Harper's Author's National Editions through 1916. The Author's National Edition volumes are slightly smaller than the volumes of the Hillcrest Edition, measuring only 5" wide by 7 1/2" high. Harper's Author's National Edition was the first edition released in 25 volumes. In order to keep the price low, Harper had deleted the Tiffany title page and tissue guards for the frontispieces. For a few years the sale of the Author's National Edition ran concurrently with Harper's higher priced Hillcrest Edition. Samuel Clemens died April 21, 1910. The next version of Harper's Author's National Edition issued circa 1913 features books bound in red cloth with a filigree cornstalk design on the spine of each volume and a cameo medallion of the author on the cover. Harper's Author's National Edition issued in red cloth after Clemens's death features cornstalks embossed on the spine and a cameo of the author on the cover. Advertising for sets in this binding appeared 1913-1916. The price was $25 or discounted to $23.75 if a customer paid within 30 days. The same cameo imprint was used on Harper's Limp Leather Edition of Mark Twain's works introduced in 1915. 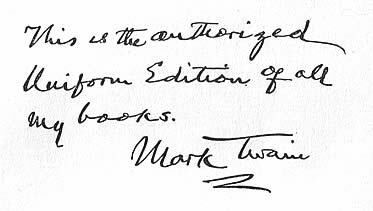 A million copies of "The Author's National Edition of Mark Twain's Complete Works" is a big record for the publishers, but the tribute to the memory of an author whose gaiety, wit, satire and pathos have never been rivalled by another other American writer is even greater. I account myself fortunate as I sit in my little library and survey the twenty-five handsome volumes which recall so many pleasant hours spent in the halcyon days when I had time to seize upon the originals and forget everything else, under the grateful and fascinating spell of the author's versatile genius. ... few of those who have bought them will ever regret the dollar a volume which Harper & Brothers charge for the splendid edition of books ... (p. 725-25). If the reviewer's statement is correct, Harper would have sold 40,000 sets in six years in order to have reached the "million copies" milestone. In the spring of 1915 World War I was still confined to Europe but war headlines brought the news close to home as Germany increased submarine warfare and Americans who traveled abroad became increasingly at risk. The advertising campaigns for Mark Twain's works featured headlines "Be Happy!" An ad from Cosmopolitan Magazine for March 1915 features quotes from two former United States Presidents Theodore Roosevelt and William Howard Taft and the current President Woodrow Wilson praising Mark Twain's works. The ad hawked Mark Twain's works as an "antidote for the blues" and were needed "now, more than ever." It is one of the earliest ads featuring an illustration from Mark Twain's works -- Following the Equator. The advertising campaign for the Author's Uniform Edition in red cloth binding ran through the Christmas buying season of December 1915 and on into the Spring of 1916. 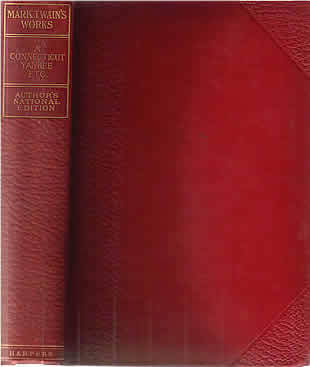 The sale of the set in this red cloth binding ran concurrently with yet another and slightly more expensive edition that Harper introduced in January 1915 -- the red Limp Leather Edition. As World War I intensified in Europe and it became apparent the United States would be pulled into the conflict, Harper's advertising included a copy of Mark Twain's "War Prayer." Ad from World's Work magazine April 1916 featured a reprint of Mark Twain's "War Prayer"
During the second half of 1916, a new ad campaign began. This campaign featured the Author's National Edition bound in green cloth. Each volume includes statement, "This is the authorized Uniform Edition of all my books. Mark Twain." Archives of Harper & Brothers, 1817-1914 [58 microfilm reels]. (Cambridge, England: Chadwyck-Healey; Teaneck, NJ: Somerset House, 1980).